Hon. Ebenezer Okletey Terlabi is a Ghanaian Politician and Researcher whose major aim in life is to put smiles on the faces of the poor and help alleviate the suffering of the masses. He is well known for his result-oriented policies. He is a proud product of the University of Ghana and holds an MPhil in Biochemistry from the Kwame Nkrumah University of Science and Technology (KNUST), Ghana. Between 1991 and 2000, he worked as a Research Officer in the Department of Pharmacology and Toxicology at the Centre for Research into Plant Medicine, Mampong Akwapim. He became a lecturer at the Department of Biochemistry(KNUST) and had published numerous research papers. He once served as the Deputy Eastern Regional Minister and Deputy Minister of Defense. Hon. Terlabi is a member of the West African Network of Natural Product Scientists (WANPRES), Chemical Society, Ghana Science Association and Biochemistry society of Ghana. 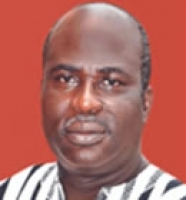 Currently, he is the Deputy Minister of Lands and Mineral Resources and also the Member of Parliament (MP) for Lower Manya Krobo Constituency in the Eastern Region of the Republic of Ghana. He brings his rich experience to bear on the vision of GHI.